Made from concrete panels and available in 2 sizes, a 3' 6" x 3' x 2' that stores 300kg of coal and a 3' 6" x 3' x 3' 6" that stores 600kg of coal with sliding metal doors and treated hinged timber lids. Available in a smooth or spar finish. 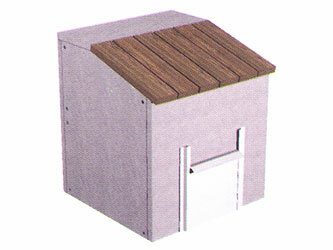 Supplied in flat sections unassembled with fixing instructions. A concrete base is required.